The Survey’s mission statement is to study and protect archeological sites, record and preserve information about those sites, and to convey the knowledge we gain from this work to the people of Arkansas. As part of fulfilling the third part of this mission, we create and present educational products to the public in several forms, including the printed word. Information about Survey publications and how to order them can be found on our website here. The Publications Program today consists of three series. Research Series is a refereed publication series for scholarly works about Arkansas archeology or related fields that have significance at the state or regional level. Popular Series is a refereed publication series for works on Arkansas archeology and related fields that are intended for general audiences including school children, teachers, and the general public. Technical Papers includes works such as equipment operating manuals, descriptions of analytic procedures, field and lab manuals, documentation of computer applications, short reports, and other specialized materials. Our most successful Technical Paper is No. 11, A Handbook of Soil Description for Archeologists (2002), by Greg Vogel. This 32-page booklet has sold many copies and is valued alike by beginning field school students and by professionals. In the past, there was also a Research Reports series, conceived as a quick way to put out reports of archeological fieldwork with less editorial attention and a lower production cost. This series was terminated in 2006 with No. 32 and all new submissions merged into Research Series. The Publications Program is self-funded through sales and occasional grant money. The number of Survey staff who contribute to this endeavor has fluctuated over the years, and the structure of the program has varied. At present the program is guided by a five-member Publications Committee (presently chaired by Dr. Jamie Brandon) answerable to the Director. A Publications Editor (Deborah Sabo) completes editorial work, book design, and production. Our graphic artist/photographer (Jane Kellett) contributes help with illustrations. A generous number of each new volume is distributed gratis to various academic libraries and offices around the state. The Survey’s Publications Program began with a book for general readers. At the Coordinating Office in 1968, the Survey worked with the UA Museum on an exhibit called “Indians of Arkansas” for the Arkansas Arts Center’s Artmobile. Linda Murphy of the Arts Center fabricated exhibits, while the Survey’s Hester Davis, Dan Printup, and Bob McGimsey worked on the labels and getting everything ready for the grand opening. The exhibit toured the state for two years and the cases were then moved into the UA Museum (until the Museum’s exhibit space closed in 2003). In the last half of 1968–69, Hester Davis, Dan Printup, and Bob McGimsey worked on preparing the Survey’s first Popular Series volume, PS01 Indians of Arkansas, based upon the research from this exhibit. 2000 copies were distributed to every elementary school in Arkansas in spring of 1969. The book then sold for $1 (eventually $3) until going out of print in 1992. It was replaced by the more up-to-date PS02 Crossroads of the Past (Schambach & Newell, 1990) and PS03 Paths of Our Children: Historic Indians of Arkansas (Sabo, 1992). Since then, there has been a revised edition of Paths (2000), which remains popular. Crossroads has gone out of print, and an updated replacement is in development. The first Research Series volume appeared in 1970. 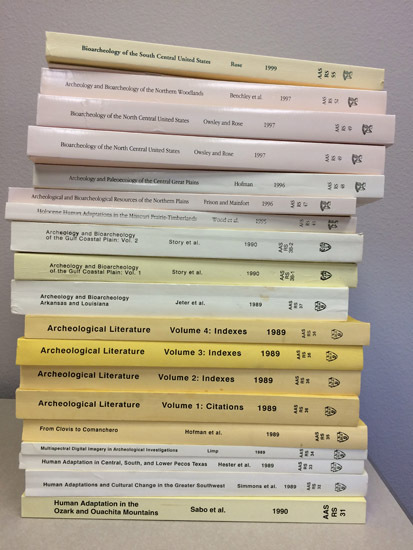 Archeological and Historical Resources of the Red River Basin, edited by Hester Davis, covered four states (Louisiana, Texas, Oklahoma, Arkansas) and presented the most up-to-date summary of research for the Caddoan archeological area at that time. The research was supported by a cooperative agreement between the University of Arkansas Museum and the Southeast Region of the National Park Service, and the report was produced in conjunction with the Comprehensive Basin Study of the Red River prepared by the Red River Coordinating Committee of the U.S. Army Corps of Engineers (New Orleans District), and the National Park Service. The work reported in RS01 thus represents an early example of a longstanding tradition of cooperative agreements with other state and federal agencies that the Survey continues to pursue productively to this day. In the Preface to RS01, then Survey Director Charles R. McGimsey III expressed the wish that these scientific reports would become the “firm foundation” upon which Arkansas would be able “to preserve its past for the future” (the Survey’s slogan at the time). 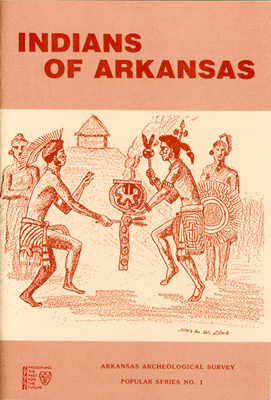 The first Research Report was A Survey and Assessment of the Archeological Resources of Cadron Settlement, Arkansas, by Samuel D. Smith, published in 1974. It is the result of a contract with the Army Corps of Engineers (Little Rock District) to provide a general assessment of archeological and historical resources within an 80-acre area to be developed as Cadron Settlement Park. The project fit into the Survey’s research objectives by providing an opportunity to look for material evidence of late 18th–early 19th century Indian trade along the Arkansas River. Although Research Reports has been discontinued and new submissions of this type are now rolled into Research Series, important work was published in Research Reports over its 31-year history. Many of the titles reflect a strong performance in CRM (cultural resource management), or what came to be known as “contract archeology” during a period of water supply and other development projects in Arkansas. An early archeological survey of the Arkansas Post area (RR03, 1974), two early archeological assessments for what became Davidsonville Historic State Park (RR17 & RR21, 1979), and one for the Buffalo National River (RR18, 1979) are in this series, as is a report of excavations at one of the state’s most interesting rock art sites where the first ever radiocarbon-dated direct link was made with the rock art in an Arkansas bluff shelter and a tool kit for making rock art found in the soil deposits of the same shelter (RR31, 2004). Yet, the centerpiece of our Publications Program remains the Research Series. High points in this series over the years include two major projects that the Survey’s program was able to take on due to our combination of in-house expertise, established frameworks to work with other agencies and institutions, and great networking with colleagues across the country. These are the two Overview series and the bioanthropology manual Standards for Data Collection from Human Skeletal Remains. Overviews. The “Overviews” were a large undertaking. Two series, the first abbreviated in-house as SWDO and the second as CNPO, were produced under contract with the U.S. Army Corps of Engineers. SWDO (for “Southwest Division Overview”) has six volumes and CNPO (“Central & Northern Plains Overview”) has eight. The separate volumes, each edited and co-authored by experts from across the country, provided a systematic review of the archeological and bioarcheological resources for defined geographic regions covering the vast central third of the United States. Following the framework established for the first SWDO volume (RS31, 1988, Human Adaptation in the Ozark and Ouachita Mountains, by George Sabo III et al. ), all subsequent studies within the Overview series were organized on the principle of “adaptation types.” Not counting the volumes (RS36 and RS50) in each set devoted strictly to bibliographical citation, the Overview projects comprise 4084 pages, created, compiled, reviewed, edited, typeset, and published over a span of 11 years. This was in addition to eight unrelated Research Series volumes during the same 11 years. All of this accomplished in a program where dedicated staff numbered two individuals — an editor and a graphic artist — with other office personnel to help as proofreaders. The Overview volumes sold well and went through several printings. They were in demand among academic as well as agency archeologists, staff of private CRM firms, and graduate students, and still are sought by these audiences despite having become somewhat out of date. As volumes in the Overview series go out of print, we have placed them as downloadable PDFs on our website, free of charge. Standards. 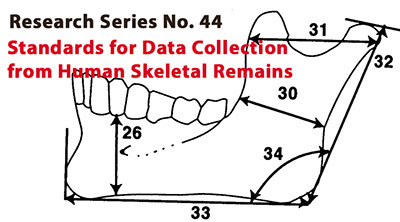 The bioanthropology text and lab manual Standards for Data Collection from Human Skeletal Remains (RS44), edited by Jane Buikstra and Douglas Ubelaker, was published in 1994. This volume, subtitled “Proceedings of a Seminar at The Field Museum of Natural History Organized by Jonathan Haas,” is the result of an initiative felt to be urgent at the time for bioanthropologists and bioarcheologists to come together and agree upon basic methods for recording data from skeletal remains. The context was the passage of NAGPRA (the federal Native American Graves Protection and Repatriation Act) through which excavated human remains that formerly had languished for decades (or centuries) as objects in museums and other repositories now would be repatriated to descendant communities for reburial. Many of these remains had never yet been adequately described or analyzed; thus, up-to-date standards were needed to make the data comparable for modern research. When it came time to seek a publisher, Dr. Jerry Rose of the University of Arkansas’s Anthropology Department, and a participant in the symposium, knew that the Survey Publications Program could handle the job quickly. Standards has remained continuously in print, with at least 15 printings (though no revision has been undertaken). It is our best-selling title, widely used as a college text in the United States and Canada. As we reach our 50th year, the Survey has published 67 titles in Research Series, with another volume in production and other submissions in review. 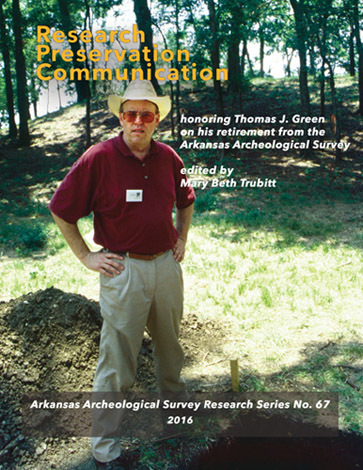 Our most recent volume (RS67, 2016) is Research, Preservation, Communication, a collection of papers edited by Mary Beth Trubitt (our archeologist at the research station on the Henderson State University campus in Arkadelphia) that is based on a symposium she organized and chaired at the 2014 Annual Meeting of the Society for American Archaeology. The volume is a festschrift in honor of former Survey Director, Thomas J. Green, and contains 13 chapters organized around the Survey’s three-part mission statement, providing a framework for a diverse range of subject matter. The Survey’s Publications Program has encountered many challenges over the years and still faces some frustrating limitations. Through these difficulties we have persevered because we believe in, and are committed to, our mission to present what we learn about Arkansas archeology to wider audiences. We haven’t done too badly with our publications for fellow archeologists (Research Reports, Research Series). Output may have slowed somewhat in the later 2000s, but we are striving to remedy that. It is not easy to say the same about our Popular Series. Although the Survey’s very first publication was a general audience book (Indians of Arkansas), we have not kept pace in this series. There are only five titles so far, two of those out of print, and we have only two new titles in development. Though it is true that information dissemination to the general public has shifted to the Internet in the last decade, we would like to increase the number of our Popular Series books. 1992 History of the Arkansas Archeological Survey. Special publication of the Arkansas Archeological Survey, Fayetteville.